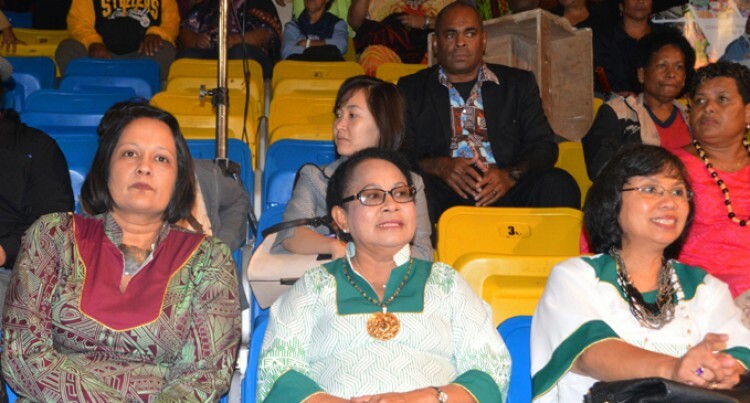 Minister for Women, Children and Poverty Alleviation, Rosy Akbar (left), with Indonesian Minister for Women Empowerment Dr Yohana Susana Yembise (middle), during the Rural Women’s Fashion Show last week. The spin-off from last week’s National Women’s Expo continues to spill in. After the announcement of high sales in the first two days, Fijian women artisans now have a chance to improve their handicraft production talents and skills. Indonesia, through its Minister of Women Empowerment and Child Protection, Yohana Susana Yembise, announced that exchange programmes would start next January for women artisans of the two countries. She revealed this during her Fiji visit last week where she was part of the three-day National Women’s Expo at the Vodafone Arena in Suva. “Fijian women have amazing talents and skills,” she said while inspecting displays of products produced by women and their fashion show during the Expo. “I encourage you to work with the Ministry of Women to continue developing your skills and reach out to the programmes provided. She said her ministry would work with its Fijian counterpart to strengthen partnership for the economic empowerment of women. “I have mentioned to the Minister that from next year we are going to have women’s exchange programmes so that Fijian women can visit Indonesia for training and likewise Indonesian women will visit Fiji,” Ms Yembise said. Minister for Women, Children and Poverty Alleviation Rosy Akbar said the key areas in the partnership included women empowerment and child protection. “We hope to learn new ideas and skills through the exchange programmes. Plans are to select budding business entrepreneurs from this Expo and see how best we can send our women to Indonesia and have Indonesian women come over to Fiji, for transfer of skills. “We thank the Indonesian government for its continued support in providing skills training opportunities for the women in Fiji,” she said.